What is called mint garnet is usually a pastel, slightly bluish-green shade of grossular garnet. They can be attractive, but they are usually quite pale in color. 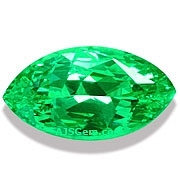 It is not a gem that inspires much excitement, certainly not when compared to the rich chrome green tsavorite garnet. 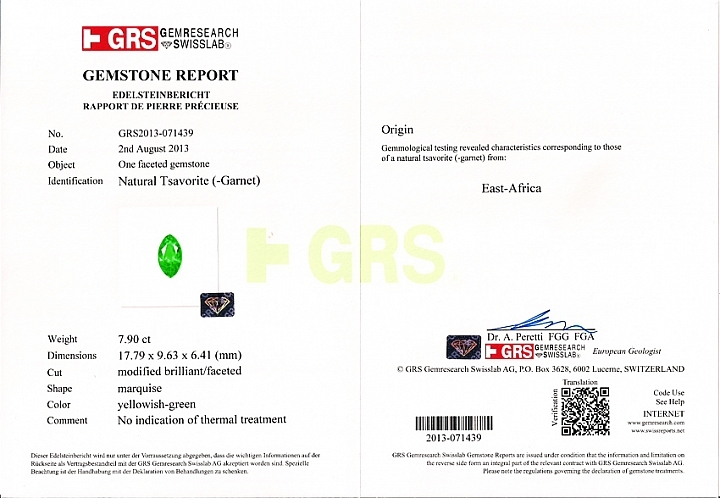 However, recently we acquired a remarkably vivid mint garnet marquise with such terrific color saturation that it was certified by GemResearch Swisslab (GRS) as tsavorite garnet. This is an usually bright and brilliant gem, and exceptionally clean (graded "almost loup clean"). The size is also unusual-- at 7.90 carats (about 18 x 10 mm), this is a very rare gem. This mint tsavorite garnet is completely natural and untreated and was one of the prides of our collection. It was sold to a private collector in September, 2013. See the GRS report below.